Recipe courtesy of Paul Kahan, Chef-Owner of Blackbird, Avec, Big Star and The Publican in Chicago, Illinois. Simmer smashed garlic, 1 tablespoon olive oil and a knob of butter in a small saucepan over low heat until ingredients are blended. Place potatoes horizontally on a cutting board. Starting at one end, thinly slice each potato, cutting three quarters through potato. Be careful not to completely cut through potato. Drizzle garlic oil mixture over potatoes and bake about 40 minutes in a preheated 425°F (220°C) oven, until exterior is crispy and interior is soft. While potatoes are baking, heat saffron, sliced garlic and remaining olive oil in a saucepan over low heat. Slowly bring oil to a light simmer and when garlic is golden, remove pan from heat to infuse until potatoes are done. When potatoes are done, strain saffron oil through a fine meshed strainer. 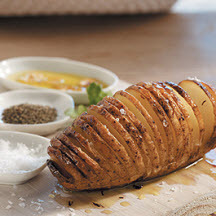 Drizzle about a tablespoon of oil over each baked potato and serve.